Why do you need a Snellville injury attorney? Snellville is a close knit community where people develop connections to the business owners and professionals in their Gwinnett County community. If you live in or near Snellville, then nothing can replace the comfort and convenience that you will have when you hire a law firm that is located in the Snellville. The Griffin Law Firm’s main office is located in Snellville, Georgia. Our firm has specialized in personal injury, wrongful death, workers’ compensation, and social security disability since 1994. We have vast experience handling cases in Gwinnett County which means we have developed a rapport with the Gwinnett County judges and Gwinnett County defense attorneys. This can make all the difference in making sure you receive the best possible settlement for your injury or disability claim. Client Reviews: Client reviews or testimonials allow you to hear from our real clients regarding how they really felt about our Snellville injury attorneys at the Griffin Law Firm. As you will see, our clients are truly happy with us and recommend us to others. Firm Awards: Firm awards allow you to see if our Snellville lawyers have been received awards and peer reviews to know how the legal community feels about the Griffin Law Firm. If you use this link, then you will see that attorney Richard Griffin has been rated “AV Preeminent” by the Martindale-Hubble. This rating is a peer review that cannot be bought or altered. You will also see that we have also received a rating of “Superb” on Avvo from an additional peer review. Settlements and Verdicts: Attorney Richard Griffin also encourages you to review our Snellville law firm’s settlements and verdicts to see for yourself that we have a history of success in the areas of personal injury, wrongful death, workers’ comp, and social security disability. What connections does the Griffin Law Firm have to Snellville, Georgia? Snellville Attorney: Attorney Richard Griffin has lived and worked in Snellville, Georgia for many years. He moved the Griffin Law Firm’s main office to Snellville, Georgia in 2004. His law firm has been located in Gwinnett County law firm since 1998. Gwinnett Education and Atlanta Training: Attorney Richard Griffin attended high school in Gwinnett County (Greater Atlanta Christian School), and then college (Emory University) and law school (Georgia State College of Law) in metro Atlanta, Georgia. While in law school, he gained invaluable experience as an intern for the State Board of Workers’ Compensation in Atlanta, Georgia. Atlanta Law Office: The Griffin Law Firm’s main office is located at 2336 Wisteria Drive, Suite 540, Snellville, Georgia 30078. The firm also has an office in down town Atlanta, Georgia at 50 Hurt Plaza, Suite 820, Atlanta, Georgia 30303. They answered all of my concerns about my case. I am very satisfied with the results. This firm was always helpful and sympathetic. They really went the extra mile to get me the settlement I needed. What I liked best was the firm’s speedy response. They handled my case very well. Rating 5 out of 5 stars. The updates were quick and they were professional. I would recommend them to my friends and family. I was very happy with my settlement and with my sign up with Richard Watson. Rating 4 out of 5 stars. The Griffin Law Firm is made up of people who are nice, helpful, responsive, and caring. They were easy to deal with and didn’t make me feel like a number. Rating 5 out of 5 stars. They were responsive to my questions and handled my case well. Rating 4 out of 5 stars. This firm is friendly and provides quick service. They know their business and ran my case smoothly. I strongly recommend this firm. Friendly service and immediate attention to my claim. Rating 5 out of 5 stars. This firm is honest, hard working, and treat you like a friend. They kept me informed and were pleasant, professional, and honest. They exceeded my expectations. This firm delivered professionalism at every stage of my case. They are hones and deliver fast service. These are really great people. Rating 5 out of 5 stars. They made it easy and were fast and flexible. I recommend this personal injury attorney. This firm is caring, honest, and attentive. They provided great communication and professional representation. I received the maximum amount possible for my case. Snellville Recoveries: The Griffin Law Firm has recovered many great settlements and verdicts for our personal injury and workers’ compensation clients in Snellville, Georgia and throughout Georgia. Snellville Auto Accident Settlement of $595,000.00: Our Snellville personal injury client was badly injured in a car accident and required $160,000 in medical expenses and had lost wages of $40,000. Our Snellville injury lawyers recovered $595,000.00 for this personal injury claim. Snellville Lawyers win a $2,500,000.00 in a Lilburn Truck Accident: Our Snellville truck accident lawyers were able to obtain a jury verdict of $2,500,000 for this head on collision. The medical expenses were over $100,000.00. Snellville Attorneys Settle a Walton Count Workers’ Comp Claim for 660,240: The claimant was injured when he fell off a roof injuring his back, knee, and ribs. This 660,240 settlement involved a lump sum payment and a Medicare Set Aside (MSA). Gwinnett County Courts for Snellville Personal Injury Claims: Our Snellville personal injury and workers’ comp lawyers have handled thousands of claims in Snellville, in Gwinnett County, and across Georgia. Superior Court of Gwinnett County: The Gwinnett County Superior Court is located at 75 Langley Drive, Lawrenceville, GA 30046.
o The Gwinnett County Superior Court judges include Judge Kathy Schrader, Judge Debra K. Turner, Judge Ronnie K. Batchelor, Judge Michael C. Clark, Judge George F. Hutchinson, III, Judge Karen E. Beyers, Judge Melodie Snell Conner, Judge R. Timothy Hamil, Judge Thomas N. Davis, and Judge Warren Davis. o The State Court judges include Judge Emily Brantley, Judge Carla E. Brown, Judge John F. Doran, Judge Joseph C. Lannazzone, Judge Randy Rich, and Judge Pamela D. South. Snellville Workers’ Compensation Court: All workers’ compensation claims in Snellville or anywhere in Gwinnett County are normally tried in the State Court of Workers’ Compensation of Georgia. Gwinnett County claims can be tried in Atlanta based on the fact that Fulton County is a contiguous county of Gwinnett County. The State Board of Workers’ Compensation is located at 270 Peachtree Street, N.W., Atlanta, Georgia 30303. The Atlanta workers’ compensation judges include the following: Chief Judge David Imahara, Judge Viola Drew, Judge Stephen B. Farrow, Judge Meg T. Hartin, Judge Elizabeth Lammers, Judge Johnny Mason, Judge Andrea Mitchell, Judge Vicki L. Snow, Judge Charles Spalding, and Judge Carolyn S. Weeks. Snellville Social Security Claims: The Social Security Administration is the court where you can apply for social security disability benefits. The Social Security Administration office closest to Snellville, Georgia is located at 4365 Shackleford Road, Norcross, GA 30093. Their phone number is 1-800-772-1213. Snellville social security lawyer Richard Griffin has had great success winning social security disability benefits even after the claimant was initially denied. It is very important to call us as soon as possible if you are denied because you only have 60 days to appeal. 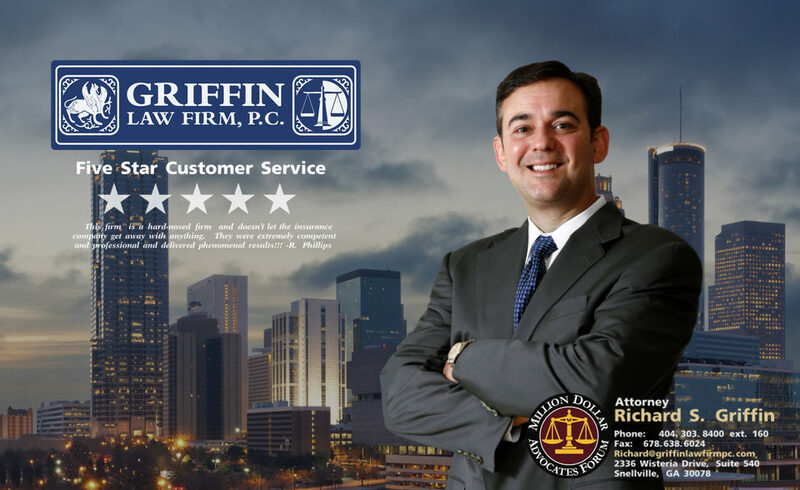 Free Legal Consultation: Call attorney Richard Griffin for a free legal consultation if you have a personal injury, workers’ comp, wrongful death, or social security disability claim. Our Snellville law firm is convenient and local for anyone in Snellville, Georgia or throughout metro Atlanta. Call us today to 877-PAIN-LAW or 877-529-7070.